“Routing” describes the cutting of the board profile, outline or contour. We use a 2 mm cutter for this. Any feature which can be cut with the 2 mm cutter is part of the profile. “Milling” refers to any slots or cut-outs inside the PCB, but also to any slots in the profile of the PCB which can’t be cut with a 2 mm cutter. 즉 라우팅은 2mm 커터로 보드의 외곽을 자르는 것이고, 밀링은 보드 안쪽에 있는 cut-out 또는 슬롯을 더 작은 툴로 작업을 하는 것이다. 일반적이지 않기 때문에 PCB 업체에서 작업을 빠트릴 수 있다. 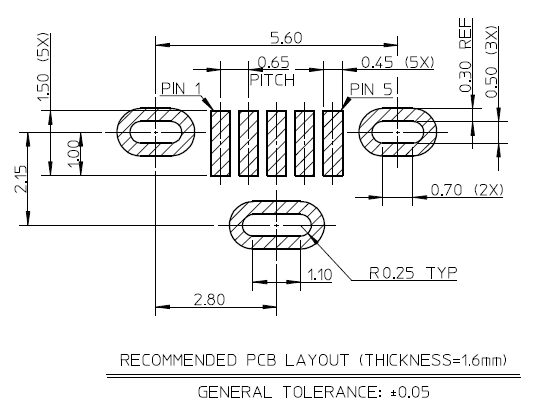 따라서 따로 알려주고, 0.50 mm 라인으로 작업을 하는데 Eagle CAD에서는 Eagle CAD에서는 Milling Layer 46에 작업을 한다. 하지만 PCB 업체에 따라서 이 작업이 안될 수 도 있다.